SLAC’s team of dark matter hunters recently gained a new member. 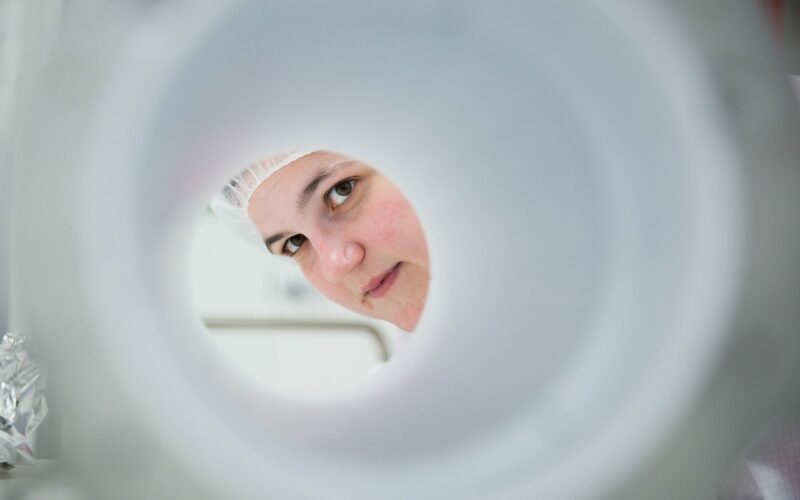 Astrophysicist Kimberly Palladino joined the lab in October 2014 to develop a test facility for the future LUX-ZEPLIN (LZ) detector, which will be the largest and most sensitive dark matter detector of its kind. LZ will greatly expand on the capabilities of two similar, smaller-scale experiments – the current LUX and former ZEPLIN experiments. Dark matter accounts for almost 85 percent of the matter in the universe. Yet, it has thus far eluded detection and its nature remains unknown. With the LZ experiment, Palladino and her fellow LZ researchers hope to learn more. The detector’s centerpiece will be a huge container filled with 7.7 tons of liquefied xenon gas. It will be installed at the Sanford Underground Research Facility, approximately 1 mile underground, to shield it from cosmic disturbances. If everything goes according to plan, the experiment will begin in 2019 to hunt for hypothetical particles known as WIMPs, or weakly interacting massive particles, which many theorists suggest are the fundamental building blocks of dark matter. In this interview, Palladino talks about her role in the LZ project and her motivation for complex dark matter research.